Please don’t forget, if you hold an EA licence to fish for Salmon and Migratory Trout a catch return must be sent to the EA. The link above is provided for your convenience. It is also always available at the side of the page. You will need your licence number and postcode, alternatively the paper copy which came with your licence needs to be posted soon. The upstream counts for October have finally been published on the EA site. ( see the links at the side of this page). The figures have been updated and now show a combined figure for the new fish pass and the existing pass at Durham. This shows 7956 fish through the counters in October and 20999 so far this year. Compare these figures with the Tyne where just short of 10,000 fish ran in October. If you compare the rivers for size and catchment area this would suggest that the Wear compares very favourably with England’s top Salmon river. See the Winter News Letter for more information about our Grayling Day. Following on from the recent organised fishing days on the ponds, to determine fish stocks and species,we have decided to hold a similar style of event on the river. 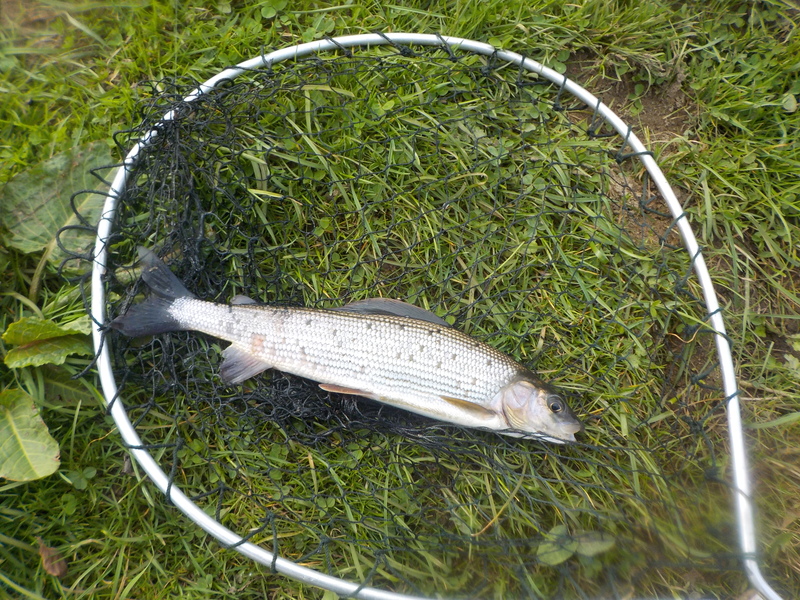 We have had reports of some decent Grayling being caught by anglers. So to determine the stocks of Grayling in the river and the size of the fish, we are organising a Grayling day. The club is after volunteers to fish specifically for Grayling. We are looking for anglers to fish for the lady of the stream using fly and bait. The normal grayling restrictions apply with respect to the hook size and breaking strain of the line. The main difference being that along with the usual fly and worm is that we will be allowing the use of maggot for this day only. The date for the Grayling Fishing day will be Sunday 29th November. If the river conditions are not suitable then the event will move to the 6th December. Only anglers who register an interest for the organised date will be eligible to fish. Any angler interested in joining in this fishing day please contact the Secretary for further information. If you are unable to make the date we would still love to hear from anglers who can provide feedback on the Grayling in our waters. We cannot give the same relaxation of rules as on the day itself, but if you can get out for some Grayling fishing please let us know how well you do. Please be sure to leave nothing behind on the banks of the river or ponds. A dog being walked by a member has had problems with waste nylon and weights in the area of the ponds. We’d prefer to think this left by mistake. You can see the problem quite clearly here and while we would prefer to think the angler intended to take this home but made a mistake, that could be a very serious mistake. The club has a rule about litter and waste nylon for precisely this reason. At the very least waste nylon should be cut into small pieces, but better still, take it home and dispose of it correctly. This time it was a dog, next time it could be farm animals … we enjoy excellent relationships with our Riparian owners which is very important to the future of the club, it is vital not to spoil this. Please take care. Thank you. Grayling at Willington … it’s not all over after all. 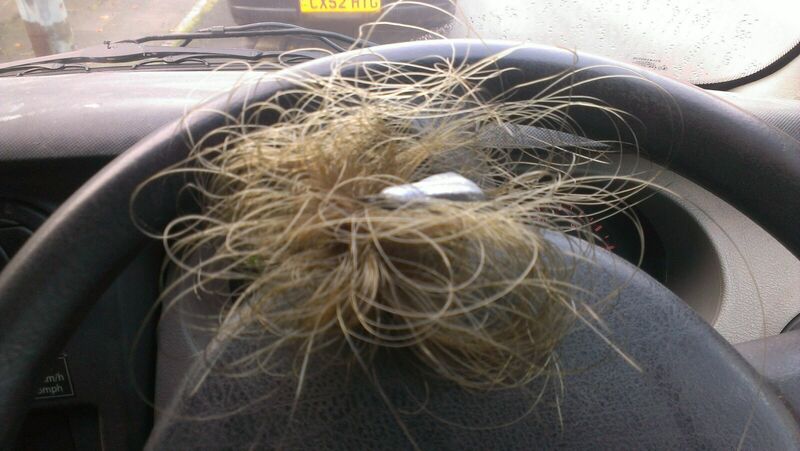 Caught earlier this year, no doubt grown on considerably since then. We have not tended to put a lot of effort into Grayling Fishing on our waters, why not? Walking the bank during October you will have seen the tell tell signs of Grayling sipping at the surface. If you’re anything like me I forget to label my flies “trout only” and catch Grayling when I least expect, I’ve even had them fishing at night for Sea Trout. We know that there are plenty of Grayling in our waters and we have heard of 2lb and 3lb fish being taken by trout anglers. I’ve had a few in the 12 inch range this year without looking for them, it’s got to be worth a cast. So, if you want to avoid being boxed up for the winter or just can’t bear to put the rods away why not give it a go. Let us know how you get on. Well, the rain came, the river rose, and rose, and kept on rising. A few hardy souls braved the high water but otherwise mother nature finished our season with a hint of irony. Too much water. So , that’s it all over then, The Trout Season went by and now the Salmon Season has closed, except for one important thing. Don’t forget it is compulsary to send a Catch return to the EA if you have a Migratory Fish licence, do it now before you forget. 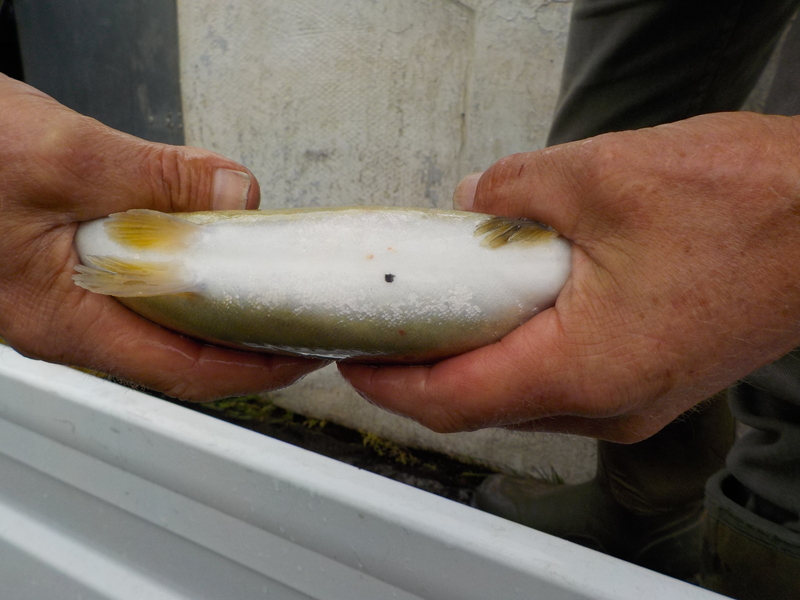 Also the club asked for your catch returns, particulary in respect of Triploid Trout, marked with a black spot. It really is beneficial to know what has been caught, we are trying to plan a stocking policy to ensure great fishing for all , it really helps if we have good information to work with. A catch return form is provided on this site or in your membership book, please make the effort to return one version or the other.